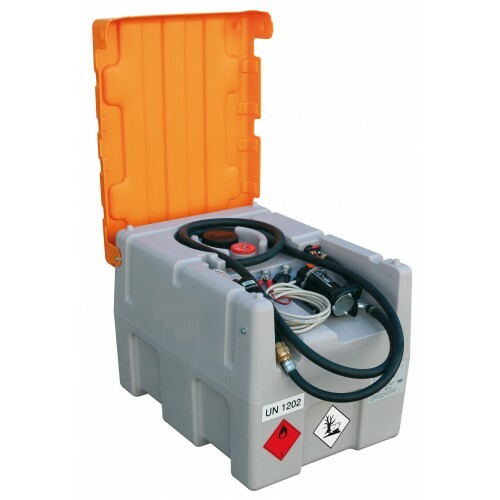 Polyethylene transportable tank for the transport of Diesel fuel according to ADR 1.1.3.1C. Polyethylene transportable tank for the transport of Diesel fuel according to ADR 1.1.3.1C. Suitable for vehicles and machines refuelling, both in work and leisure environments. The pump included in the system allows quick and easy refuelling. The TT Trolley Diesel is light and compact, and can be easily moved using the dedicated handles. Self‐priming electric pump, 12V, 25 l/min, with automatic dispensing nozzle, 3 m hose, cable and clamps. Always working : when vertical and when horizontal.